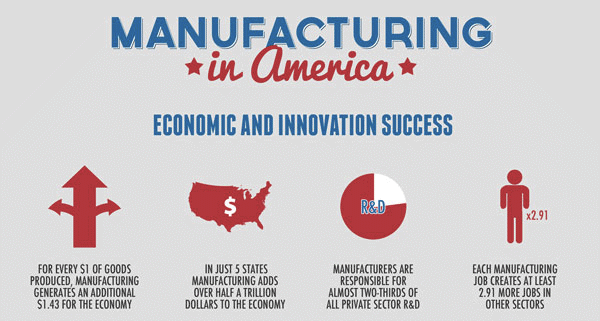 Manufacturing Day 2014 is right around the corner, and we are thrilled there are so many opportunities this year for students and educators across the country to learn more about the world of manufacturing. Manufacturing Day is not only an opportunity for individual manufacturers to come together and address ideas and challenges, but also a way for the future generation of manufacturers to join the discussion and see what the industry is really like. Sponsors and co-producers across the country are hosting events including facility tours, presentations, and career expos. You can read a comprehensive list of Manufacturing Day events, by location, across the country here. For more information, check out the visitor’s resources. One of the great infographics provided in the visitor’s resources. Lastly, we had such a blast with the social media contest we had during IMTS 2014, we were so excited to to learn there will be a special Manufacturing Day social media challenge that runs all the way through November 11, 2014. Supporters can get involved on both Facebook and Twitter. Read more about contest guidelines here. 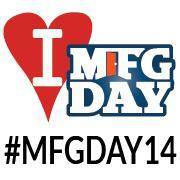 #MFGDAY14! Make this image your avatar and get tweeting!